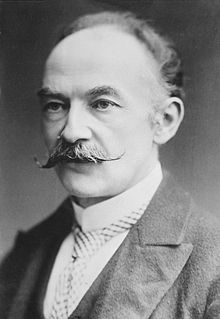 This week we are celebrating the anniversary of Thomas Hardy's birthday 178 years ago. His poem, Men Who March Away, was written and published in the Times on September 9, 1914. He was inspired by Dorset soldiers marching to the train station on their way to fight in France during World War I. Can much pondering so hoodwink you! The poem is fitting as it is also Memorial Day weekend in the U.S. in which we honor those who died in service to our country. The earliest observance began around the time of the civil war. "On May 5, 1868, General John A. Logan, leader of an organization for Northern Civil War veterans, called for a nationwide day of remembrance later that month. “The 30th of May, 1868, is designated for the purpose of strewing with flowers, or otherwise decorating the graves of comrades who died in defense of their country during the late rebellion, and whose bodies now lie in almost every city, village and hamlet churchyard in the land,” he proclaimed. The date of Decoration Day, as he called it, was chosen because it wasn’t the anniversary of any particular battle." Situated just outside London, Buckinghamshire is known for its scenic beauty (Grand Union Canal and Chilterns) and high property values with a long and distinguished list of residents. During WWII it was the home base of the codebreaking at Bletchly Park.